MPVs - 2 | What Car? We understand You need an MPV, but you dont want to end up driving around in a sloppy old bus. 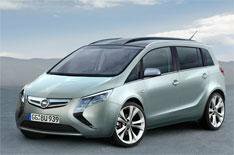 Thats fair enough and the current Zafira does a pretty good job as an MPV that still steers reasonably well. By the time the next version arrives, the Ford C-Max will have been around for a couple of years and that, judging by Fords other dynamically strong cars, could well give the Vauxhall a run for the money. Vauxhall will need to improve on the current cars handling, then, as well as improve the flexibility of the seating. We expect the third row of seats to still stow neatly into the floor, but were looking forward to a much more flexible and easy-to-use second row. Want a bit of MPV practicality and flexibility, but dont need something massive? The Kia Venga could be the answer. At a little more than 4m long, the Vengas no monster, but it looks good and has a roomy cabin. The sliding 60/40 rear bench also folds flat into the floor when its not needed. Two petrol and two diesel engines will be available and, like other Hyundai and Kia products, they will have eco-driving features such as an engine stop-start system, gearshift indicator and low-friction tyres. Safety is high on the agenda, too. Electronic stability control and six airbags come as standard Kia is confident of a maximum five-star Euro NCAP rating for its new MPV. No, the second-generation Meriva isnt getting a V12 engine, but it will feature Rolls-Royce Phantom-style rear-hinged back doors for easier access to the cabin. Called Flexdoors, these open to 90 degrees and were previewed on the near-production-ready Meriva concept car at the Geneva motor show in 2008. They will make the Meriva a useful little car for those who need excellent access to the rear of the cabin to fit child seats, for example. To comply with EU regulations, the rear doors will open only when the car is stationary. The Meriva will also feature an adaptable centre console that slides fore and aft. The Sharan and Alhambra will have been on sale for 15 years by the time new versions of each appear next year. Thats more than double the lifespan of many cars, so these latest full-size MPVs wont come a moment too soon for Volkswagen and Seat. The digital image here pictures the Sharan, complete with the nose from the latest Golf. It also shows the car with a sliding side door which, although a potentially heavier and more expensive design, would certainly make life easier in car parks especially if it comes with automatic operation like on the Citron C8 and Peugeot 807. Volkswagen and Seat acknowledge that theres been some speculation about the sliding door, but wont confirm, or even hint at, whether it will feature. Look out for an answer early in the new year on whatcar.com. Were still in the dark over the seating configurations of the new Sharan and Alhambra, too, but its likely that both cars will remain seven-seaters. While theres plenty of flexibility in the layout of the current models, and bags of space, the seats are heavy and cumbersome. VW and Seat need some of the easy operation techniques of newer MPVs, such as the Chrysler Grand Voyager and Citron Grand C4 Picasso. The VW/Seat platform was also once used for the Ford Galaxy, but Ford has already gone its own way, replacing its big MPV three years ago. Seat cant wait for the new Alhambra to come along. It says it still sells around a thousand of the current model (right) each year, old though it is, and reckons customer research has identified strong brand loyalty among buyers.